As the traffic safety community begins to plan for autonomous vehicles (AVs), Safe Kids Worldwide wants to be sure children – our most vulnerable passengers – are protected. In 2018, we chaired a Blue Ribbon Panel to ensure the needs of children are at the forefront of this conversation. Download the Blue Ribbon Panel’s full report, or scroll through this website to get a list of the panel members, the call to action and the recommendations on protecting children as this emerging technology continues to develop. This is an exciting time for the road safety community. Research tells us that a significant number of motor vehicle crashes are tied to human error, but in recent years, we’ve seen enormous progress in trying to remove that from the equation. In its most exciting form, we’re witnessing the emergence of self-driving cars (or autonomous vehicles), which offer great potential to reduce injuries and save lives as well as enhance mobility for diverse groups in our society. While not yet available to consumers, driverless cars are hardly something off in the distant future. As of June 2018, 29 states and the District of Columbia have enacted legislation related to the testing of autonomous vehicles and governors in ten states have issued executive orders. Automated vehicles are very much a part of our current world. As dozens of cities across the country host and plan pilot tests, industry leaders are identifying their tremendous potential and discussing some of the concerns and issues that might arise. But one thing has been absent from the conversation so far: An understanding about the unique needs of children, our most vulnerable passengers, when it comes to this emerging form of transportation. As the leader of a nonprofit organization that has spent 30 years working to keep children safe on the road, I knew we needed a collaborative effort to address the risks that our youngest passengers might face as they begin riding in potentially driverless cars. And we need to make that effort now, during the development and testing phase – not when automated driving systems or driverless vehicles are the norm on our streets, roads and highways. With this in mind, Safe Kids Worldwide convened a Blue Ribbon Panel on Children in Autonomous Vehicles, which met for the first time on April 20, 2018 in San Antonio, Texas. We invited nationally recognized child safety advocates and transportation experts to brainstorm, collaborate and ultimately to develop the first-ever set of recommendations to keep children safe as passengers in automated driving systems or autonomous vehicles. With this report, I am proud to present the nation’s first call to action and set of recommendations to ensure the safety of children in autonomous vehicles. As you’ll see in the following pages, the panel recognized that it is imperative to call on all autonomous vehicle developers and component designers to evaluate and ensure their products are created to protect child passengers. The panel identified many areas of need and developed a set of eight recommendations across policy, advocacy, enforcement, communications, research and development arenas. The collective traffic safety community will see immediate and longer-term opportunities to act on these recommendations. Safe Kids Worldwide is committed to putting the work of the panel into action. In the months ahead, we hope to facilitate an ongoing national conversation about these important recommendations our panel has put forth. As I said, this is an exciting time for the road safety community. It’s also the right time to make sure that the needs of our children stay top of mind. The Blue Ribbon Panel on Children in Autonomous Vehicles is calling on developers of autonomous vehicles (AVs) to ensure that AVs are engineered, deployed and marketed to protect the unique needs of child passengers. Developers are broadly defined to include original equipment manufacturers, non-original equipment manufacturers, as well as designers of component systems such as LIDAR, chip or satellite manufacturers, and others building key components of AVs. AVs must be developed, regulations upgraded and laws passed to ensure children will be properly restrained, have the highest level of protection in a crash, and can be appropriately supervised during a trip. This panel believes it is imperative that minor children never be transported without appropriate supervision by a parent, guardian or caregiver until best practices are adopted. 1. Safety standards. Support modifications to the federal motor vehicle safety standards (FMVSS) that ensure child safety systems can be used consistently as children are transported between vehicles at various stages of automation. Provide standardized plain language/pictograms for consumers who transport child occupants using adaptive, add-on or integrated equipment. Recognize that changes to the vehicle cabin design may significantly impact child passenger safety restraints and testing protocols now conducted only in a forward- facing vehicle seat orientation. 2. Usability testing. Conduct or sponsor usability testing that includes families transporting more than one child and considers the needs of children at different ages and developmental stages in tests of all new features in AVs. We know that adults are being included in usability tests, including AV pilot programs currently underway in cities across the United States. However, it is not clear if children are included in this testing. Developers should conduct or sponsor testing and be transparent with the public to build confidence in the fidelity of the testing process. Transparency, part of the National Highway Traffic Safety Administration’s original policy framework on automated vehicles, should be considered a valuable part of the entire safety system that evokes confidence among passengers. Families of young children of varying ages and various restraint needs. Families or caregivers that transport more than one child. The multiple needs of children with developmental and physical disabilities. Child-specific needs with new features and alternative seating configurations that may affect FMVSS. Child interaction with vehicle features in circumstances with inadequate adult supervision due to an impaired, incapacitated or absent adult. Testing should include communicating with adults outside of the vehicle to understand how children would interact with AVs in situations where an adult passenger has become incapacitated, e.g. due to a medical emergency. 3. Inclusive design. Seek input of child passenger safety experts throughout AV product development and design to ensure the safety needs of children at all stages and ages are accommodated and there are no unintended adverse consequences. Ensure that child-centered best practice recommendations are considered and evolve as each new advancing automated feature is developed. Having the child safety community at the table during the development and innovation stages rather than after vehicles and features are in production will decrease risks and enhance child safety. Safe Kids Worldwide and other child-focused experts on this panel are well positioned to provide input from child safety advocates and experts in this effort. 4. Appropriate supervision. Conduct research that informs best practices and policy recommendations regarding the appropriate level of supervision for children of different ages and developmental stages in AVs assuring enhanced safety simultaneously with innovation. No one is there to meet the child at the AV destination? The AV breaks down or is re-routed to an unknown location? The child cannot communicate a problem with the AV? The child becomes ill or injured? One child attempts to leave the vehicle before arriving at a programmed location set for all passengers? A supervising adult in the vehicle is sleeping or impaired? 5. Marketing standards. Ensure all marketing and advertising shows families riding in AVs according to best practices. Product developers are in a unique position of communicating and modeling safe behaviors in relation to their products. Today, vehicle manufacturers have high standards that show proper restraint of children in their marketing and advertising. But it wasn’t always this way. 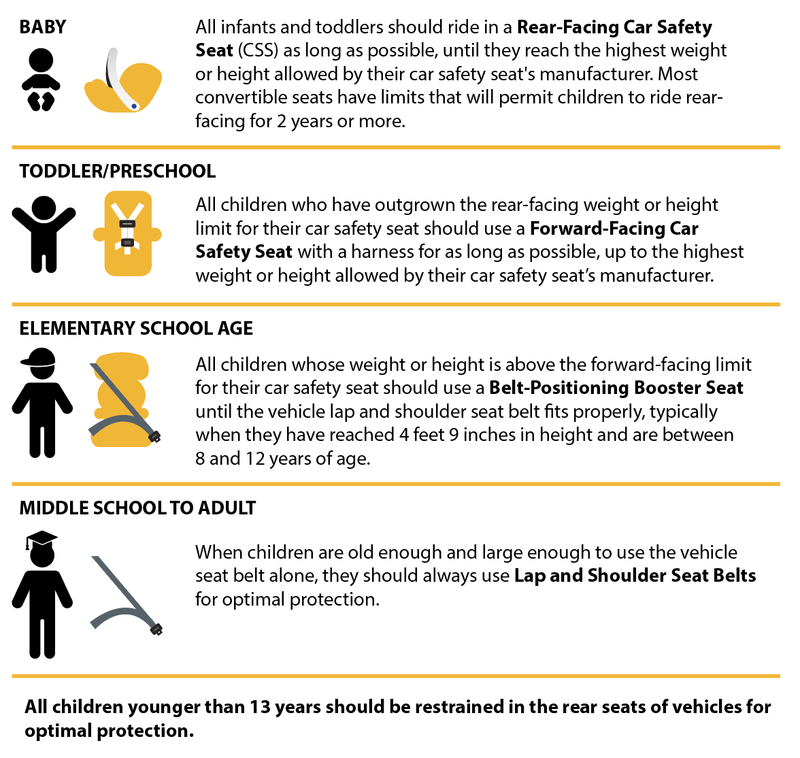 Two decades ago, a Blue Ribbon Panel on Vehicle and Child Restraint Incompatibility urged manufacturers to always show children in the correct restraint for their age and size and properly restrained according to best practice in their advertising campaigns. Advocates worked with the industry for years to achieve this progress. As product developers market exciting new AV technologies, their advertising agencies and dealer sales staff will be eager to show the future of transportation. We want to ensure they consistently model safe transport of children at every juncture. At this first meeting of the Blue Ribbon Panel on Children in Autonomous Vehicles, panelists discussed an array of possible recommendations. This report distills those discussions into the top priorities and opportunities for immediate actions. As the field and technology evolves, so too will the recommendations for action. Our call to action outlines the five key actions described earlier that we believe are necessary at this stage of development and testing. In addition to these actions, the panel has identified the following eight recommendations. 1. For law enforcement and education purposes, develop a universal definition of “driver” or caregiver for vehicles transporting children through age 12, including those with physical and/or cognitive impairment, specifically articulating responsibility for the child occupant’s safety in a driverless vehicle. 2. Evaluate how autonomous vehicle occupants will be identified by seating position on uniform traffic citations as the interior cabin changes. 3. Develop an approach for what elements are included in the national crash reporting databases as the field evolves. 4. Develop model legislation provisions and best practice language for states that maintain strict, universally- applicable child passenger safety standards that ensure children of all ages are protected. 5. Convene a multi-year consortium of child safety advocates and transportation experts, along with industry partners that monitors research and progress and generates ongoing policy statements and advocacy guidance that reflects an evolving field. 6. Develop and use consistent language and messaging with the public that reflect the technology transition from advanced driver assistance systems to autonomous vehicles. Currently, many features in newer vehicles (such as park assist and lane departure) are precursors to full autonomy. 7. Develop and implement education for certified child passenger safety technicians on the features and safety issues relevant to autonomous vehicles (beginning with current advanced driver assistance system features). Prioritize education in cities and states where autonomous vehicles are being tested. 8. Develop and implement education for first responders and law enforcement officers on the features and safety issues relevant to autonomous vehicles and child occupant restraints. Prioritize those who are also certified child passenger safety technicians and those who work in cities and states where autonomous vehicles are being tested. 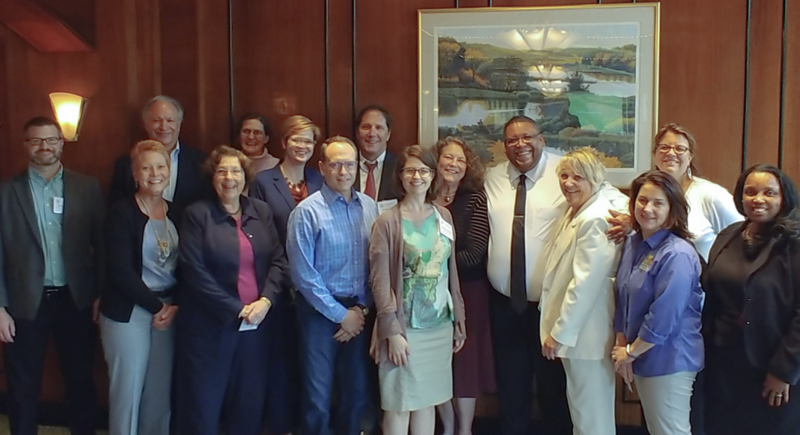 This voluntary panel is composed of nationally-recognized child safety advocates and transportation experts from a range of sectors representing public policy, behavioral science, human factors research, automobile testing, product liability, developmental pediatrics, consumer advocacy and education, law enforcement, product design, car seat manufacturers, and automakers. 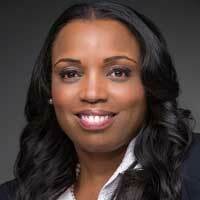 David E. Campbell & Associates, Inc.
**Anne Marie Lewis, Ph.D., Director of Safety and Technology Policy for the Alliance of Automobile Manufacturers participated as an observer of the Blue Ribbon Panel. Observers do not necessarily endorse the Blue Ribbon Panel’s findings, recommendations or final reports. Here are some of the responses to the October 2018 Blue Ribbon Panel report. As autonomous vehicle development challenges our thinking about “drivers” and “passengers,” the traffic safety community will need to define the term “child” as it pertains to children in autonomous vehicles. The scope of this blue ribbon panel was limited to focus on children through age 12. This narrow focus enabled experts to establish an initial set of priority focus areas. The panel recognizes additional focus should be placed on children of all ages in and around AVs as this rapidly evolving field takes shape. Based on current best practices, there are four different stages of restraint use (see image below) needed to ensure the safety of children. Similar terminology exists to describe this emerging technology — automated, self-driving, autonomous and driverless. But these terms don’t all mean the same thing. Today, many new vehicles include automated features such as lane keeping assistance, adaptive cruise control and parking assistance, but a driver is still required to take control at any time. 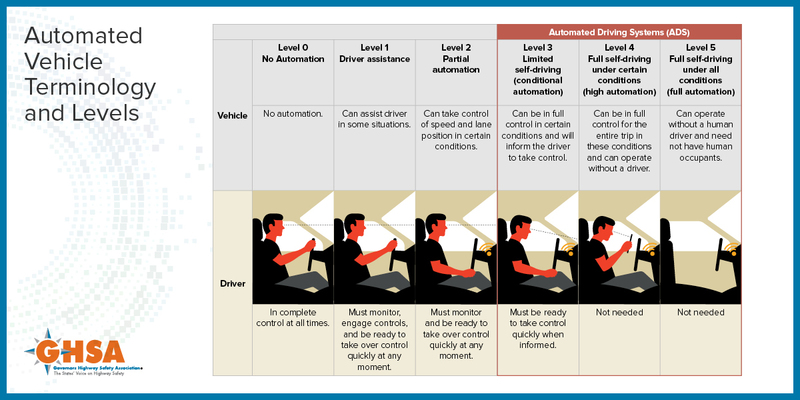 SAE International (the Society of Automotive Engineers) defines six levels of automation — from no automation (where a fully engaged driver is required at all times) to full automation (where the vehicle can operate independently without a human driver). For general information, contact Lorrie Walker at lwalker@safekids.org. To arrange an interview, please contact: Gary Karton, Director of Content at gkarton@safekids.org or at 202-662-0630.